The initial design concept is based on [water] to express the indoor space. The water exists in [liquid] form in the nature. It will show a feeling of flow, it will flow on the floor, walls, even in the ceilings, forming a feeling of extension, which look like the liquid covers the whole space. The project finished in April 2011 in Shanghai,China, and was exhibited to custom in May 2011. We chose the oak to show the liquid form, and connected the liquid forms of second floor and the first floor together, from the ground of the first floor extended to the walls, ceilings, and then extended up from the stairwell to the floors, walls, ceilings of the second floor. Arc-forms are also adopted in the furniture and decorative of the lighting accessories, which are more integrated to the design theme. We chose the oak to show the liquid form, and connected the liquid forms of second floor and the first floor together, from the ground of the first floor extended to the walls, ceilings, and then extended up from the stairwell to the floors, walls, ceilings of the second floor. 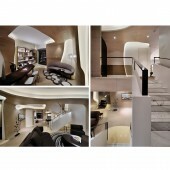 The Liquid Space Residence by Kris Lin is a Nominee in Interior Space and Exhibition Design Category. · Click here to register today inorder to be able to view the profile and other works by Kris Lin when results are announced. The Liquid Space Residence by Kris Lin is Winner in Interior Space and Exhibition Design Category, 2012 - 2013. · Read the interview with designer Kris Lin for design The Liquid Space here. · Press Members: Login or Register to request an exclusive interview with Kris Lin. · Click here to register inorder to view the profile and other works by Kris Lin. Did you like Kris Lin's Interior Design? Did you like The Liquid Space Residence? Help us create a global awareness for good interior design worldwide. Show your support for Kris Lin, the creator of great interior design by gifting them a nomination ticket so that we could promote more of their great interior designs.